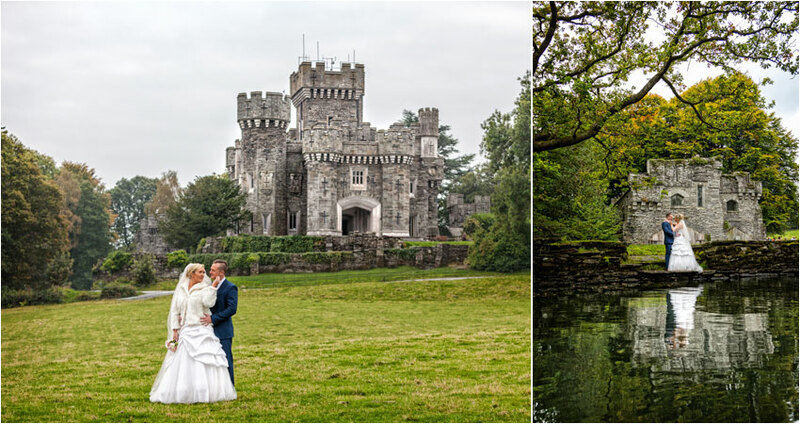 Another sell-out Wedding Portfolio weekend was held at the Langdale Chase Hotel in Winderme and the stunning Wray Castle. 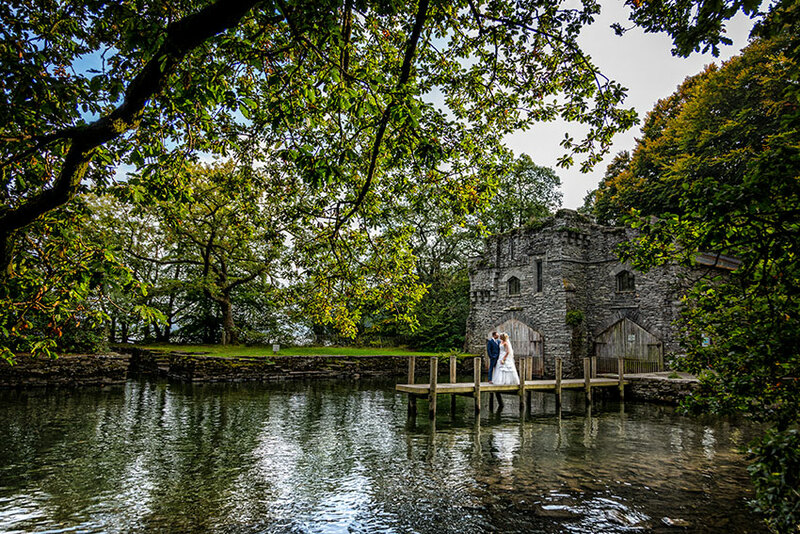 Langdale chase was the venue of choice for Saturday, topping the weekend off at the brilliant Wray Castle, which is also situated on the same stretch of water. 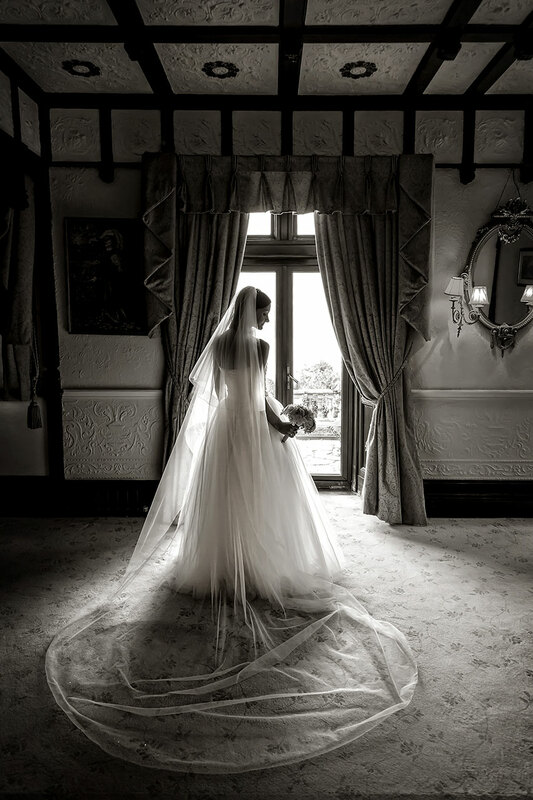 The idea of a Wedding Portfolio Day/Weekend is to enable Pro & Semi-Professional Photographers to take lots of pictures of model Brides and Grooms in real wedding venues to add to their own Wedding Portfolios. I take this opportunity to run the day as life-like to a real wedding day as I possibly can. 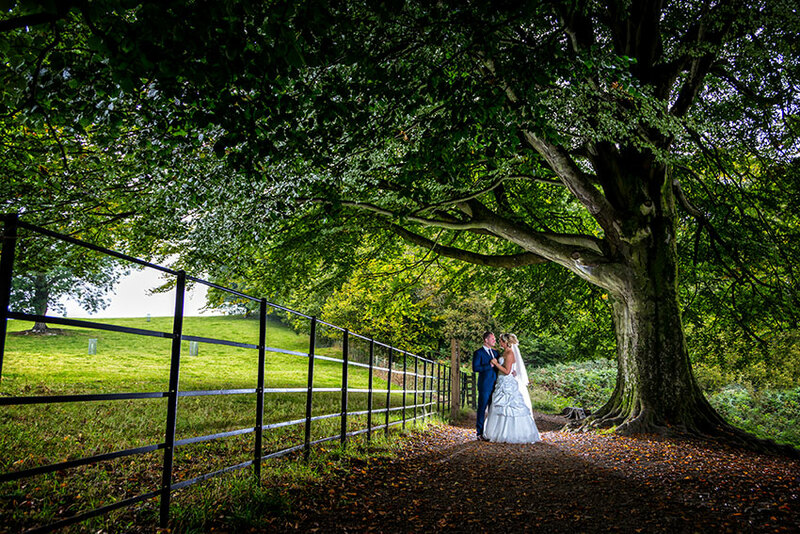 This means I teach you how to photograph the Bride and Groom exactly how I would do on a normal wedding. We use natural light, Video light and Flash, once again in exactly the same way I would. 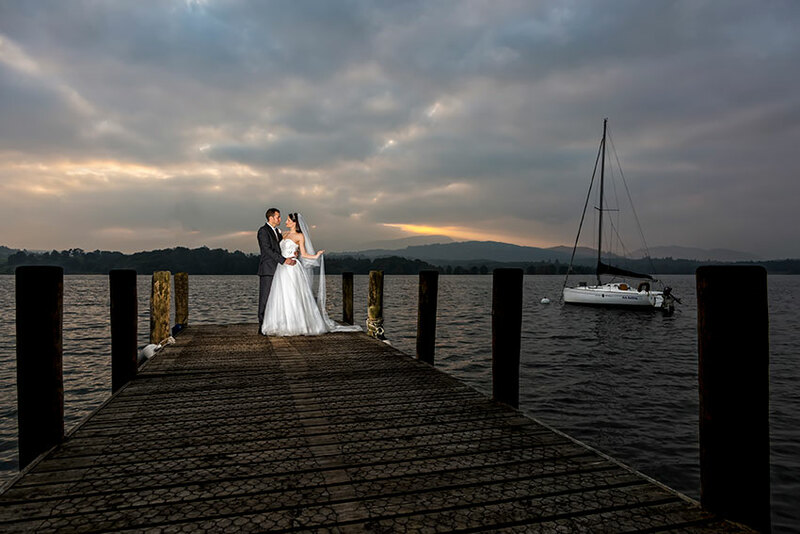 I keep numbers limited, as it is important to me to to ensure that all attendees get the best experience from my Wedding Portfolio Day Windermere. 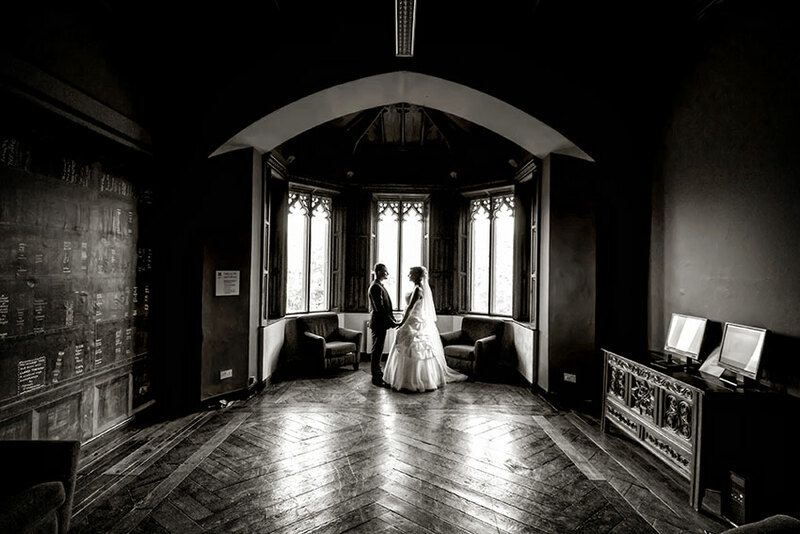 Photographs that work, Images that sell! This was a a particularly difficult shot to take for most people. 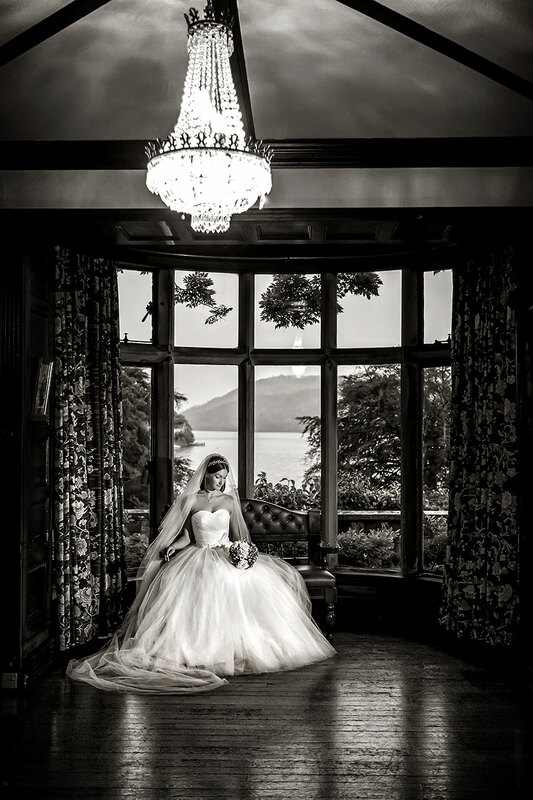 It's in a very dark room and shot directly into bright sunshine with the view of Lake Windermere in the background. The pose is delicate the composition is spot on and the balance of bright ambient light outside is mixed perfectly with video light inside. 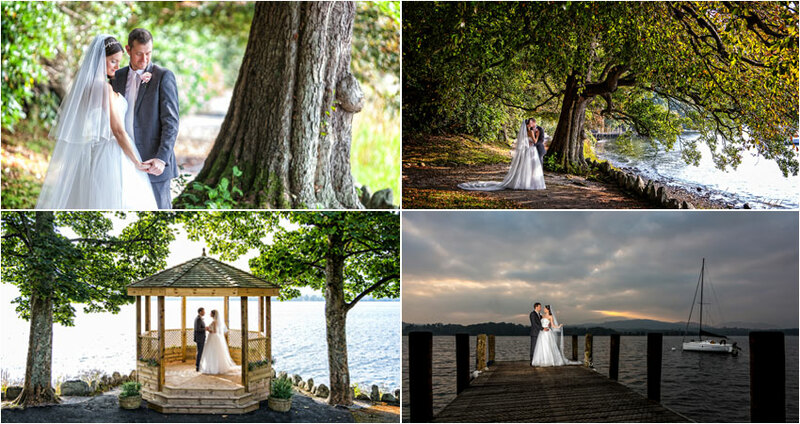 We obviously photographed the Bride and Groom here using the same lighting and in various positions - These pictures really hit the mark, pictures taken in complicated lighting like this is what 99% of photographers would shy away from but as you can see, these pictures will make you stand out - These pictures sell! Great composition complimented with a strong pose, this really works, but only if it's done right! It's important to capture the whole scene- tell the story! Whilst this kind of fun/dance pose isn't to everyone's liking, it teaches just what can be achieved if the Bride obliges! 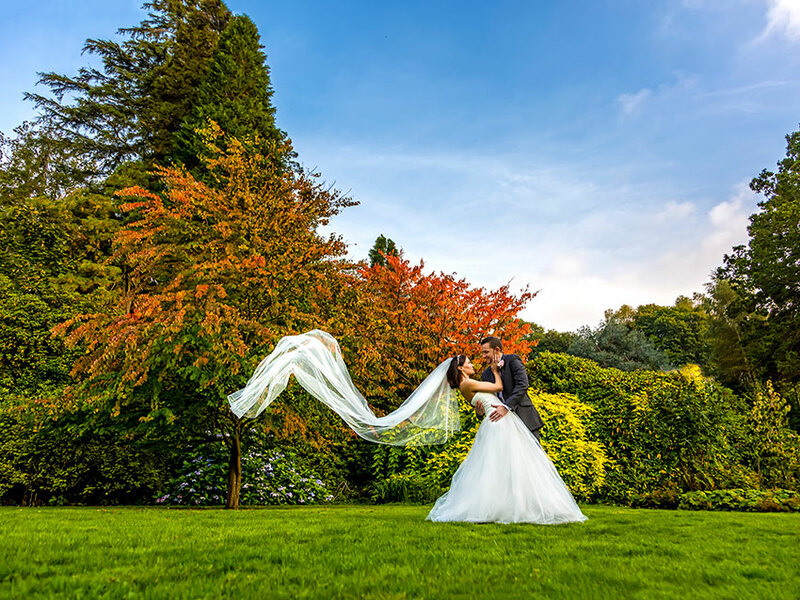 We do what we call "the swishing" pose with just about every Bride - this can only be achieved if you engage the couple correctly! 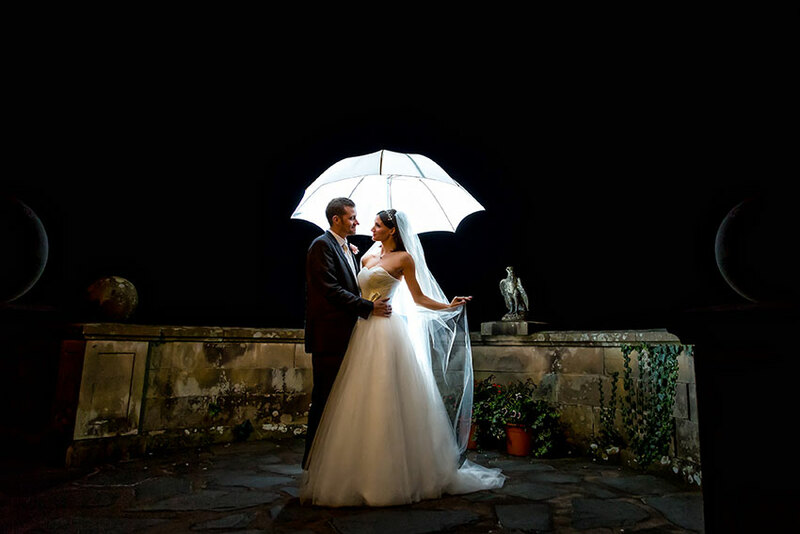 Called the Umbrella Shot for obvious reasons - This is achieved using flash from behind the subject. This is excellent for after-dark / winter weddings. 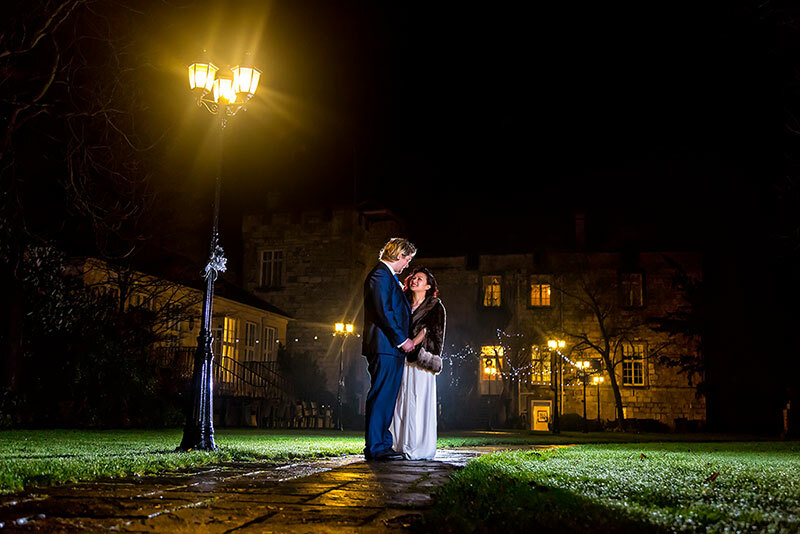 In the winter whilst most photographers are devoid of ideas or are shooting indoors using flash, we are outside taking advantage of the night sky. I normally combine this kind of shot with ambient light from the buildings and surroundings. 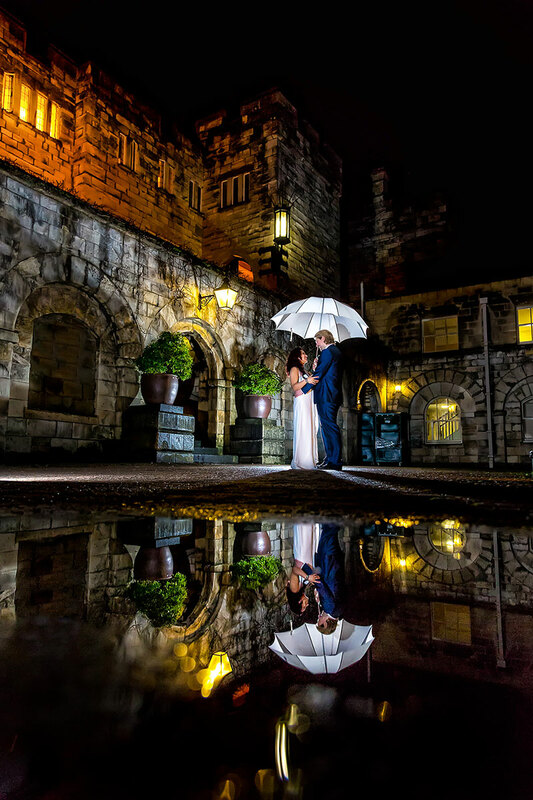 Great use of composition, I added a flash behind the couple to add drama to the scene - Works a treat! 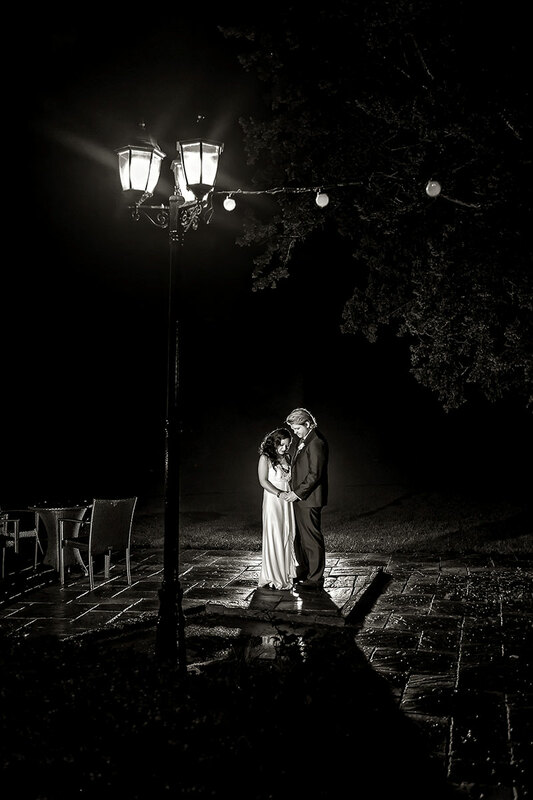 Mixing ambient light with flash enables us to really show off the skyline - I use the "Off Camera Flash" technique during every wedding we shoot. These are know to us as "The Mantelpiece" or "Money Shot" These pictures sell! Both of the above were shot using just the available ambient light from the windows. Thanks to all the attendees for a great weekend - A personal thanks for all the amazing comments too! Fancy adding some great pictures to your Portfolio?